Levy appears to attempt to tar Siné by association with unsavory characters; and goes on to say that it doesn’t really matter if he is or isn’t anti-Semitic since because French history has had its fair share of anti-Semitic episodes any words that could conceivably be negatively construed in this regard are “rancid.” Phew, is this what passes for intellectualism and ‘deep thought’ in France? “Jean Sarkozy, digne fils de son paternel et déjà conseiller général UMP, est sorti presque sous les applaudissements de son procès en correctionnelle pour délit de fuite en scooter. Le parquet (encore lui!) a même demandé sa relaxe! Il faut dire que le plaignant est arabe! Ce n’est pas tout: il vient de déclarer vouloir se convertir au judaïsme avant d’épouser sa fiancée, juive, et héritière des fondateurs de Darty. Il fera du chemin dans la vie, ce petit!" P.S. This blogger admits to loving watching “Les Guignols” on television when he lived in Europe! De quoi Siné est-il le nom , par Bernard-Henri Lévy - The denunciation. La chronique de Siné non publiée dans Charlie Hebdo - Sine rebuttal - "not fired"
Charlie, Siné, Val, grosse fatigue... - Neutral "a media tempest in a satirical teapopt"
P.P.S. 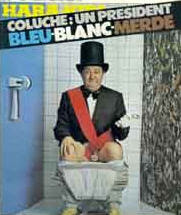 A primo example of the French love of "low brow" vulgarity was Coluche (read the links for more), pictured at top. 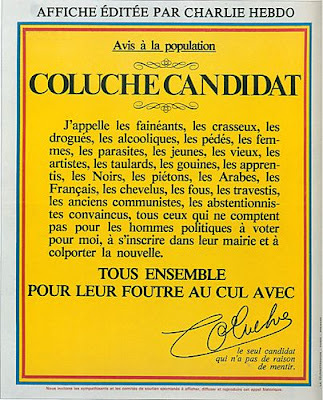 Above is one of his campaign posters from when he ran for the French presidency! Whenever this blogger hears laments from l'Academie Francaise about the degeneration of French culture (usually caused by something coming from the U.S.) he immediately thinks of those icons of French high culture, Coluche and Jerry Lewis! Vive la France! As VGE used to say at the beginning of each one of his speeches (when running against Mitterand in 1981) "La France est un grand pays!"